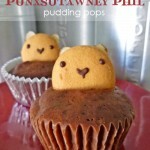 Why Doesn’t Punxsutawney Phil Get Bad PR? Phil’s rear claws are perched and some mustachioed idiot’s jacket is about to get stained. 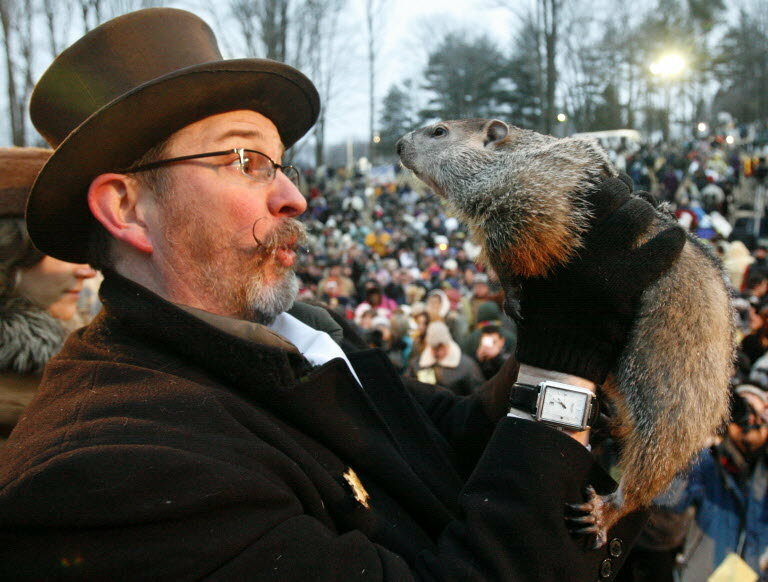 Since 1886, this varmint Punxsutawney Phil (also known by his full name, “Punxsutawney Phil, Seer of Seers, Sage of Sages, Prognosticator of Prognosticators and Weather Prophet Extraordinary” … yes, way) has been predicting the weather on Gobbler’s Knob in Pennsylvania. His job, while shifting the blame off meteorologists everywhere for one day, has been to predict the demise of weather or proclaim its extension. Question: Where’s his bad PR? Namely this year after the hedgehog of the nether regions saw his shadow again? I mean, what with the Polar Vortex and all, you would think at least those dolts in Atlanta who can’t drive in two witty bitty inches of snow would have something to say to Phil, right? Nope. Not them. Not PETA. Not even Jim Cantore of The Weather Channel dares send Phil a nasty tweet. 2. Phil is sick. Perhaps, it’s early onset to a neurological disease. Maybe, it’s just the old age. After all, he is 182 and guzzling the elixir of youth, or whatever those ‘Inner Circle’ tuxedo dudes have in their flasks. Whatever the case, consider this: you spend all year long in some hole. You are probably buried so deep in dirt that you have no clue when its summer or winter, except when the cable goes out. And even then, it’s Pennsylvania, it rains every season. So, Phil hears the regalia storming over head and the popcorn ceiling he has installed is falling all over his plastic-wrapped couch. (Damn kids, you know.) If it’s a shadow that greets him at the hole, we have six more weeks of winter. 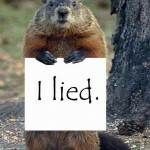 If it’s that fool in the above picture, Phil craps himself and we have an early spring. Either way, he’s forced to do this one act where he’s everyone’s national hero or maligned meteorologist. Shoot, I’d fake a headache too, and everyone in the weather department feels Phil’s pain. 3. Everyone is in on it. PETA is on every SeaWorld’s employee ess-list, and why? Because they hate them working there. PETA hates the Colonel because they hate chicken, except for the money it makes KFC. PETA hates anyone who wears fur because it probably looks better on one of those ‘Real Housewives’ than them. However, you never see a PETA protest or one of their ridiculous ads in Gobbler’s Knob. Coincidence? I think not. Do you really think the Groundhog has Mother Nature on speed dial and says, “Alright, woman! Here’s the deal: I’m warm and you’re on a rampage with this Polar Vortex thing. What’d ya’ say, screw Gobbler’s Knob and maybe rain today?” Not that Punxsutawney minds the free pub. I’m mean, Bill Murray has been dropping his name for more than a decade to get laid, so why not milk it a little more, right? And then, there’s all the marketing dollars that is paying for Phil’s family, his baby mamas (please, like he’s not going to be on Maury someday) and all those bebe kids … or hedgehogs. If none of that makes sense, you don’t think one of those old codgers would reconsider sprucing up in a tuxedo and waxing his creeper mustache for say, look up the damn weather on his app like everyone else? 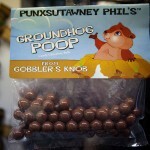 And if none of those reasons strike a chord with you, just take a look at Phil’s face — scared out of his groundhog gord! Maybe that’s why he gets no bad PR. Pity. Yeah, that’s it.